It's time for another edition of The Scoop...and this one is really special because it's #200! Yep...can you believe it? I am honored to be the host for this milestone post and I am so happy that you are joining us...both to inspire and to be inspired! I'm betting there will lots of wonderful ideas for Christmas, too, so let's get on with the party! Hi everyone and welcome to the 200th edition of The Scoop! Wow! We are so happy to have each of you come party with us every week. After all, it would not be a party without you...our talented guests! And we are also excited to see that our party has grown to over 600 links each week...amazing! Decking the halls is in full swing at my house and I want to share a fun and easy little idea that I have been waiting to try at Christmas...my VINTAGE TARTLET TEALIGHTS! I have been eyeing these little beauties on Scandinavian blogs and mulling over a way to create them. If I had known how easy it was, I would have tried this long ago! Be sure to head over to my blog to see for yourself! And I have a confession...I am a true traditionalist when it comes to the holidays! For me, it's just not Christmas unless it's red and green! My simple TRADITIONAL CHRISTMAS MANTEL reflects just that...lots of greenery with natural elements, some fun galvanized lanterns topped by burlap striped ribbons and a whimsical collection of family stockings. You can get a closer peek HERE. Also...be sure to head over to my blog to get some tips on finding ways to fit in more family time during these busy holidays. And...the good folks at Marie Callender's are sponsoring a giveaway of a $100 VISA GIFTCARD as well. Just leave a comment on my blog HERE. It's always hard to choose features, especially this time of year, but here are a few things that caught my eye this week! 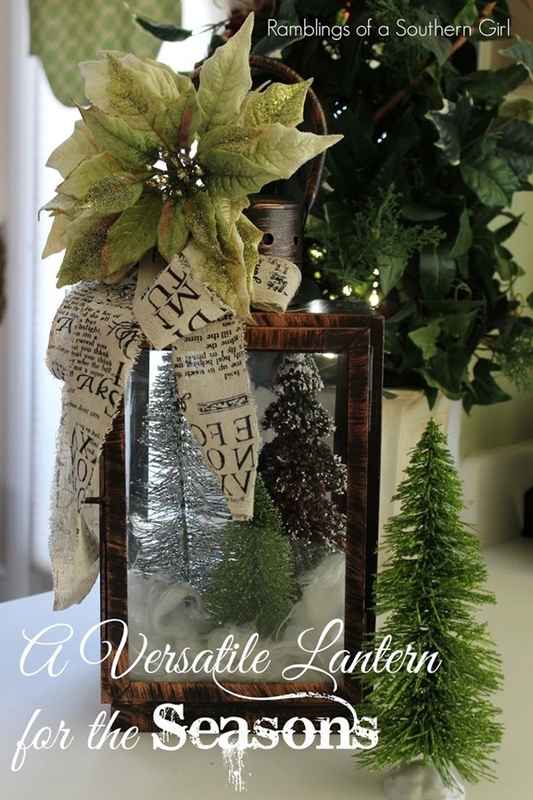 Rhonda at Ramblings of a Southern Girl showed us how she creates a VERSATILE LANTERN FOR THE SEASONS. I love the Christmas version! 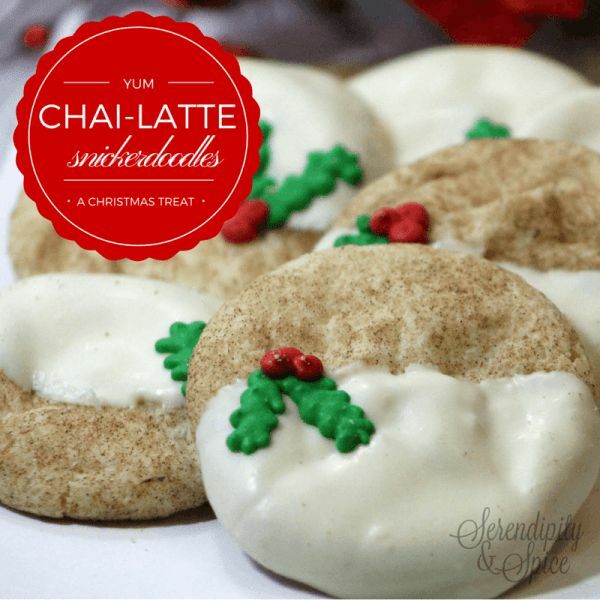 These CHAI LATTE SNICKERDOODLE COOKIES from Melissa at Serendipity & Spice look yummy...and very festive, too! 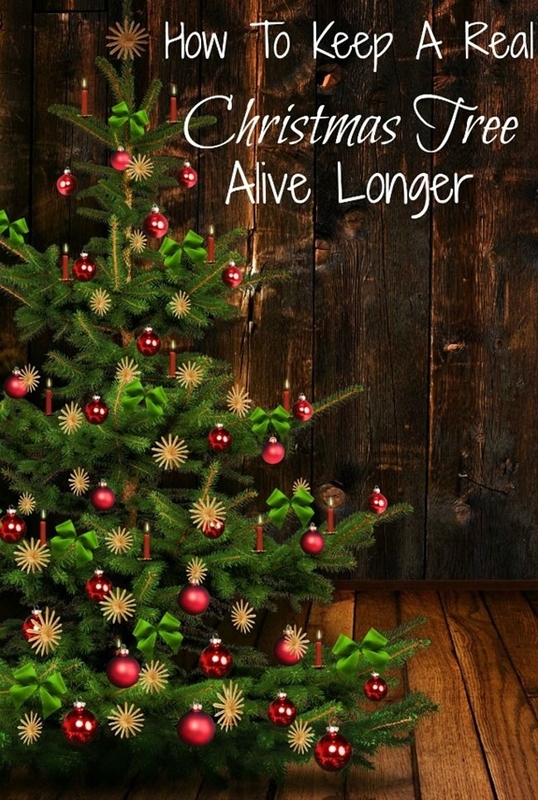 I have a real tree this year so I had to check out HOW TO KEEP A REAL CHRISTMAS TREE ALIVE LONGER. Michele and Jessica at Just 2 Sisters share some great tips! 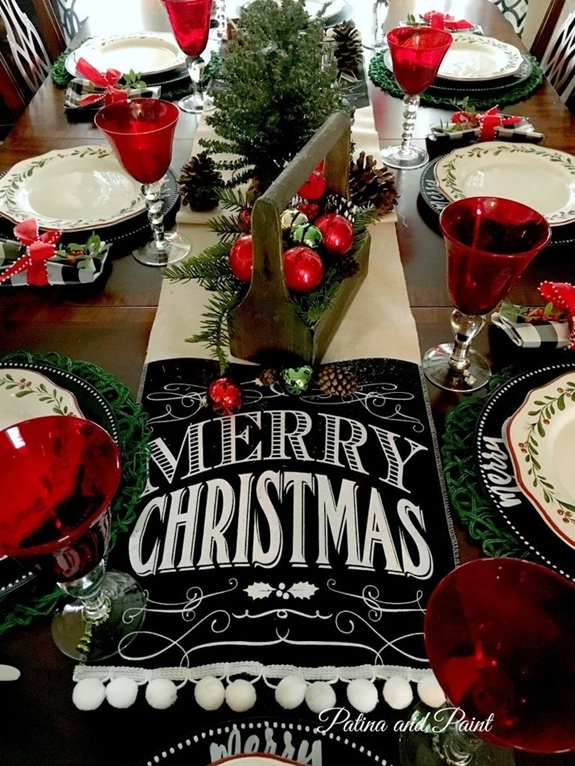 Tammy at Patina and Paint shared her tablescape for CHRISTMAS IN THE DINING ROOM. I love all the chalkboard touches! 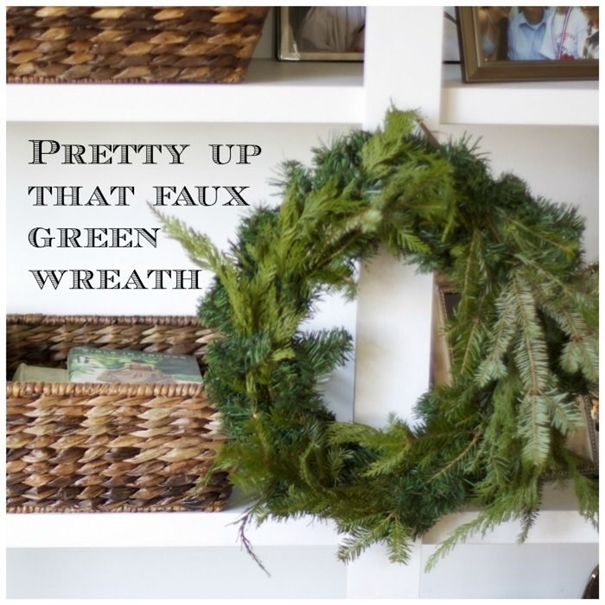 And finally, Susan at Love of Home showed us how to PRETTY UP A FAUX GREEN WREATH. Genius! And you won't believe how easy it is! And now...let's get this party started! I can't wait to see what you have to share! Great features ladies. Happy to be partying this week! Happy Holidays! Thanks so much for your traditional holiday! So much white in blogland, I always visit you for inspiration as I too have a "colorful" home!! Great party! Jolly Holiday, Debbie! !